When it comes to producing a jar of Mountain Valley Honey, there is a lot that goes on behind the scenes, and our team of beekeepers play a crucial part. So, in this month’s blog, we thought we would give you a little insight into what that part is. Mountain Valley Honey co-owner, Murray Elwood has been a beekeeper for 26 years and says that a beekeeper’s work changes from season to season. “Each day we start with an 8am meeting to go over health and safety, and confirm who is going where for the day. “At this time of year, we do our final check of the beehives before the honey flow. Then the bees are left to do their thing for the next few months, except we might add another honey box if required. “At some sites, the conditions can be too harsh on the hives to stay there year-round, such as exposed Manuka sites. Murray says that beekeeping is hard work, and there is an art to creating a hive that will produce good honey at the right time. “Beekeeping is so much more than extracting honey from the hives. “From the moment you open the beehive and pull out the first frame, you are assessing the hive. Are the Queens alright? Is there any disease? Is the hive going to swarm? “If the hive is going along well, we leave it alone,” he says. And although the final product is the honey, only 10 per cent of a beekeeper’s time is spent working with the honey. To be a good beekeeper, you need to have ingenuity, be motivated, physically fit and mentally sharp, all whilst looking ahead. 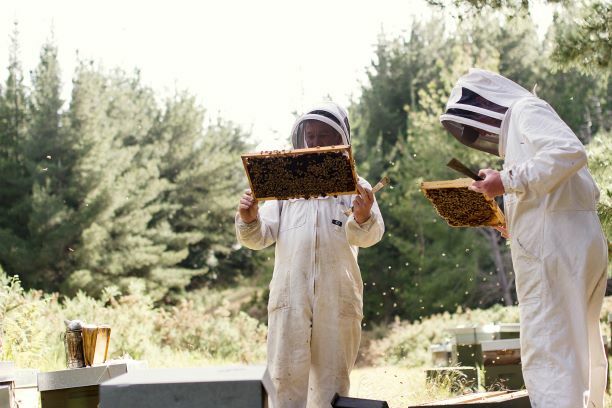 “Even then, it takes three to four years of full-time beekeeping to develop reasonable skills. To really understand beekeeping, you need at least seven to eight years,” he says. However, despite the hard work, Murray loves beekeeping, and couldn’t imagine doing anything else. “I really enjoy the outdoors and the amazing places our hives lead us to. I enjoy the scenery and the feeling of the sun on my back on a warm day. I enjoy being part of a great team of people working the hives together. When asked where he sees the future of beekeeping, Murray believes that many areas of the job will become mechanised, but the basics will remain the same.